We are an all American city. A red blooded, blue shirted, football loving town. Fair to say that sports are to be thanked for a respectable amount of our development as a city and more than a few visits from some famous faces. 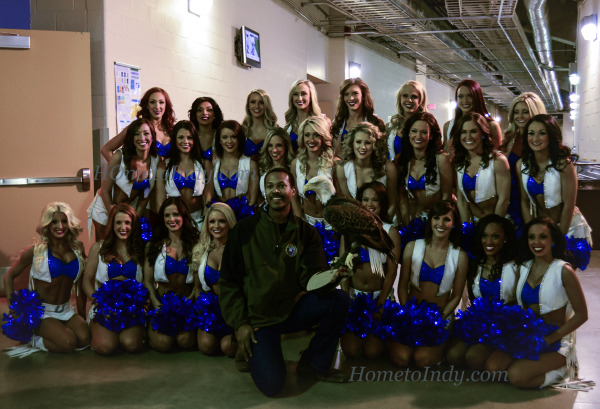 But at last weekend’s game against Kansas City we were the host to an all-American celebrity of a different kind. This is Challenger. The 24 year old Bald Eagle and his handler Al Cecere are old family friends of mine. 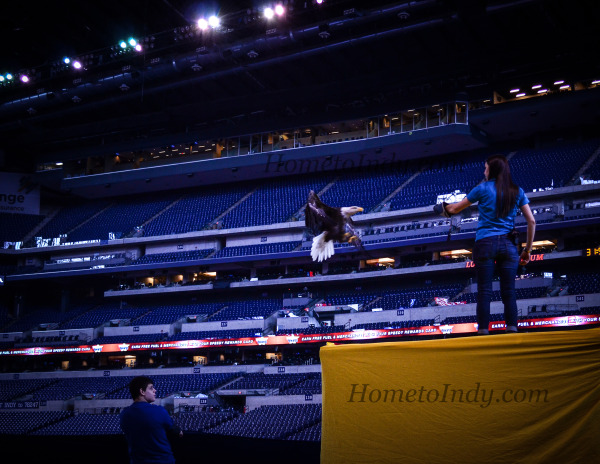 He came to Indy to fly in Lucas Oil during the national anthem. He’s visited Indy before, but this time I got to follow him around as he does what he does best; remind us that beyond the rush of the game and the pigskin and beer, the bounty we all enjoy as we watch the game is the bounty of our nation, the land of the free and the home of the brave. Challenger lives at the American Eagle Foundation in Pigeon Forge, Tennessee. The Foundation was originally founded by Al in 1985 after seeing a picture in the newspaper of poached bald eagles. That moment of outrage channeled itself into a 28 year obsession with the preservation and promotion of our national symbol. A few years after the inception of the foundation, Challenger came along. As a baby, he was knocked from his nest in a windstorm. A well-meaning human saved his life, but in the process, Challenger became imprinted, which means he no longer understands how to live in the wild and is now non-releasable. Whether or not he lives in the wild, he certainly lives a meaningful life. Challenger puts a face to wildlife preservation. 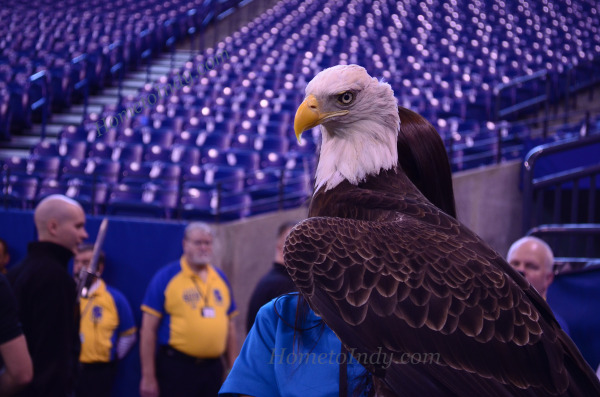 His flights at events like Saturday’s Colt’s game not only educate the public, but also raise money which goes toward the continued longevity of birds-of-prey like him. He is a bird who travels in some impressive circles. In his lifetime, Challenger has flown at over 314 sporting events, the 1996 Olympics and at inauguration events for two United States Presidents (G.W. Bush and Barack Obama) and that’s only a fraction of the list. His was the face that convinced Bill Clinton to declare June 20th National Eagle Day. He and his friend Al also marched into the offices of senators and representatives and on the power of his presence alone convinced congress to pass an act that minted a coin with his likeness which raised millions for wildlife preservation. It’s really quite incredible to see people react to him as we pass. He rides quietly from place to place in his own little enclosed coach. When you tell people there is an eagle inside, most assume you’re joking, until you pull back the screen from his window and they see his golden green eyes sharply peering out at them. There is a sort of reverence that seems to fall over people, to stand next him. Reverence and respect, because while he doesn’t live in the wild, he is anything but tame. When he spreads his wings it spans 6 feet. His beak and talons and his piercing cry serve to quell any thoughts that he is some sort of trained pet. We walk onto the field and quickly get in position for the first of our three practice flights. Across the way, the Colts cheerleaders are doing their final rehearsal. Several servicemen are assembling the field sized flag and on the sidelines there is a corp of Marines doing a bayonet drill. Lucas Oil event staff bustle in and out of the tunnels like ants in an anthill. But when Challenger flies, everything else becomes still. Every eye is focused on him. I’ve had the privilege of seeing him at quite a few events, being that we’re old friends and all, but it never fails to make me swell with awe and pride. After rehearsal we wait in our greenroom under the stands, before heading out to the National Anthem rehearsal. It’s the Indianapolis Symphony Orchestra’s brass section and it’s breathtaking. We time the anthem and select the cue for Challenger’s flight and I don’t mind the fact that we wait through several versions of the anthem. Once we have that settled, we head through the labyrinth of tunnels to the Cheerleader’s staging area to get some photos. Finally, it’s time to get in place. I’m allowed to go with Challenger, high up to the top of the stadium where his handler, Christian, will wait for a signal from a receiver on the field. The crowd is rowdy and excited and then deafening as the players come onto the field. There is the coin toss and finally the announcer tells everyone to stand for the national anthem. Men and women in uniform unfurl the enormous American Flag, while the anthem begins to play. I find myself unaccountably nervous. My camera and I don’t really have anything to do with what’s about to happen. I’m a guest in this place, but my heart pounds all the same. Christian's hand is poised over the small leather hood Challenger wears over his eyes. The strains of the anthem swell and in my head I hear the words “The rockets red glare, the bombs bursting in air, gave proof through the night that our flag was still there...." and finally, the cue, “Oh say does that start spangled banner yet wave..."
Christian slips the hood off. Challengers pupils contract and then expand in a fierce look of focus as he sees the salmon on the glove more than 100 yards away and then he’s gone. A graceful dive over the edge of the rail, his wings unfurl and he’s soaring. The entire crowd falls silent in awe and surprise. It’s just the eagle and the brass band and everyone’s collectively held breath and then, as the anthem’s final notes sound and Challenger makes one last, powerful circle over the arm of the receiver, the crowd’s screaming applause drowns out the sound of everything but their approval and pride. Our approval and pride. There isn’t a soul in the building who doesn’t feel, at least for that moment, what it is to be united, proud and free. I, for one, hope Challenger comes back. I know he does great things in the name of environmentalism, but I think he does great things for patriotism and for the hearts of Americans everywhere. And as far as Indianapolis goes, he’s my favorite sports guest by far. If you’d like more information about him, you can find it at www.eagles.org.